If you are looking for plain and simple, but comfortable, overnight accommodation in a twin bedded ground floor room, followed by a hearty breakfast, we can offer it. We, Angela and David, would like to welcome you to our old stone built house on a quarter acre fue, in the lovely village of North Tolsta, fifteen miles, (about twenty minutes by car), from the town of Stornoway. We have available a twin bedded, ground floor bedroom, with shared bathroom, next to the bedroom. A full Scottish or continental breakfast is included. From the garden seating there are sea views across the crofts and the Minch to mainland Scotland. The house is next door to the village shop/post office, also the bus to Stornoway stops outside the house. We have two small, well behaved dogs, both are people and child friendly, who enjoy walking on the nearby moors. We welcome walkers and cyclists, for whom we can provide secure bicycle storage. Within the village are three of the best beaches on the island. These are Garry beach, with the famous Bridge to Nowhere, Traigh Mhor, a mile long golden sand beach, backed by dunes, and the Traigh Ghioradall, a sandy cove backed by high cliffs. North Tolsta is the start (or end) of the Tolsta to Ness waymarked walk. There is also the Tolsta Headland waymarked walk and other good walks in the area. We are a crofting community, focused mainly on sheep rearing. The road from Stornoway passes through the villages of Tong, Back and Gress, with good beaches on the roadside. 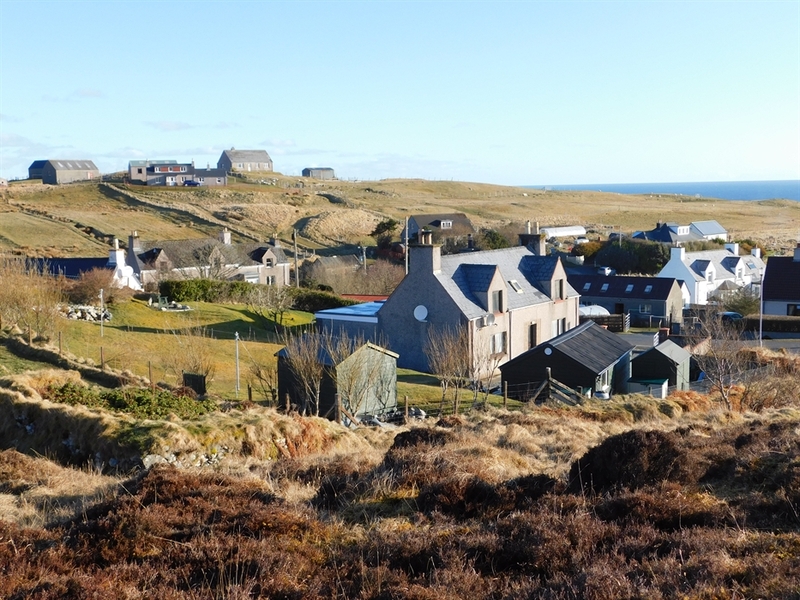 The Isle of Lewis has many interesting and visitor friendly places to see, such as the Callanish Stones, Lews Castle and museum in Stornoway, and the Arnol Blackhouse. The island restaurants specialise in locally sourced produce, especially meat and fish.